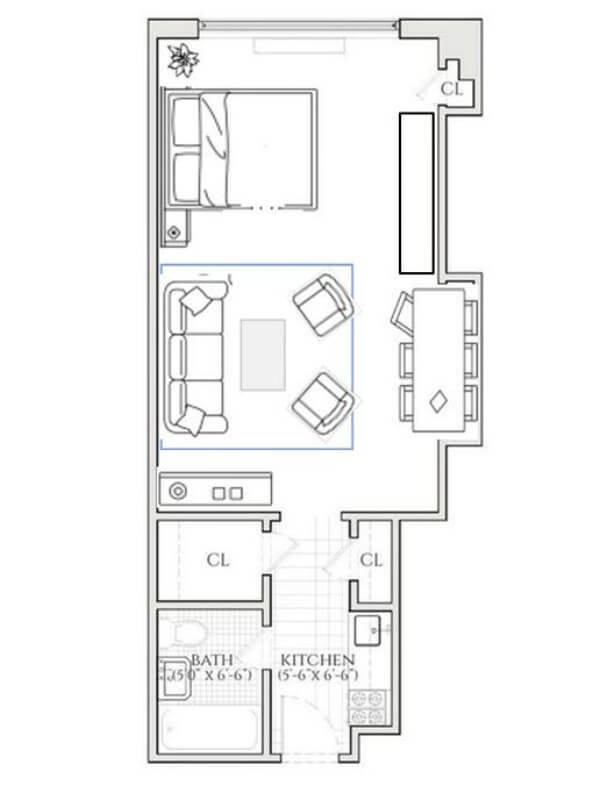 This studio apartment is in New York City. 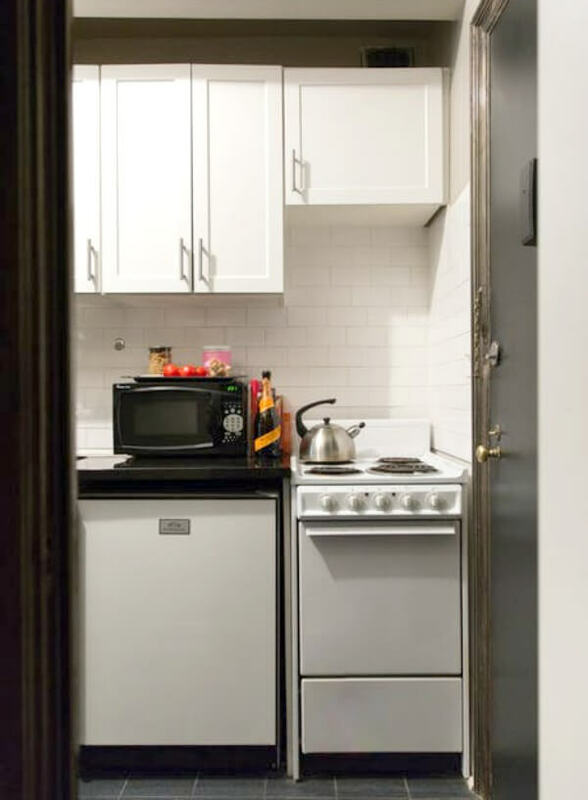 Angie has lived in this 350 square foot apartment in NYC 8 years. If you read Apartment Therapy, you might have seen this tour. But as soon as I saw it, I knew I wanted to show it to you right away. Angie is a designer, and obviously knows how to utilize and decorate a small space to perfection. She describes her aesthetic style as “champagne taste on a house wine” budget. We recently toured a small space home that had dark walls. It seems to be a trend. What do you think of it? 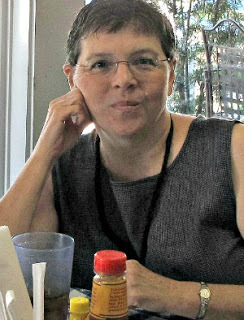 She has done a great job of separating specific areas: living space, bedroom, and dining space, without the benefit of walls to separate them. Here is Angie with her dog Sadie. She says she waits for the perfect pieces for her home at the right price. Above is a dining space where she can seat four. So even though she lives in such a small space, she can entertain. I am really surprised, pleasingly so, that she managed to fit so much in this small space. And that she did it so well and with sophistication. 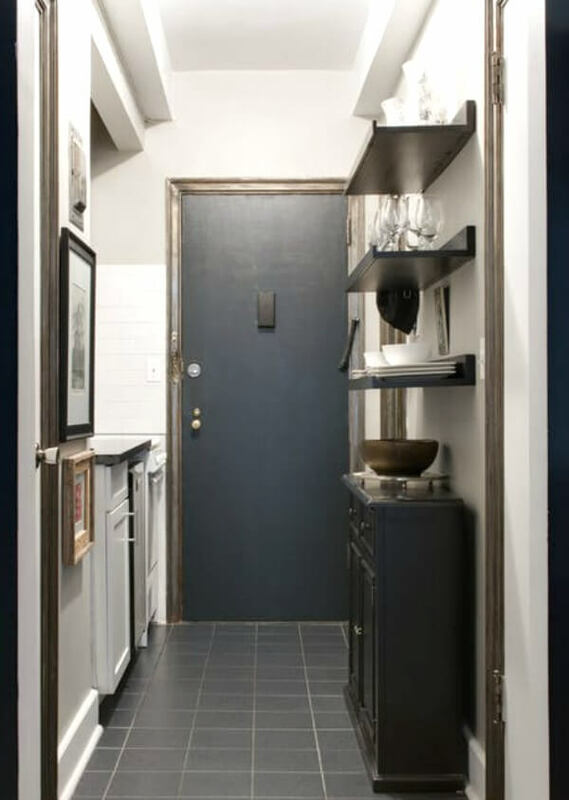 She enters her apartment by passing the tiny kitchen and bathroom before she ever gets to her larger living space. Shelves on the wall take the eye up. 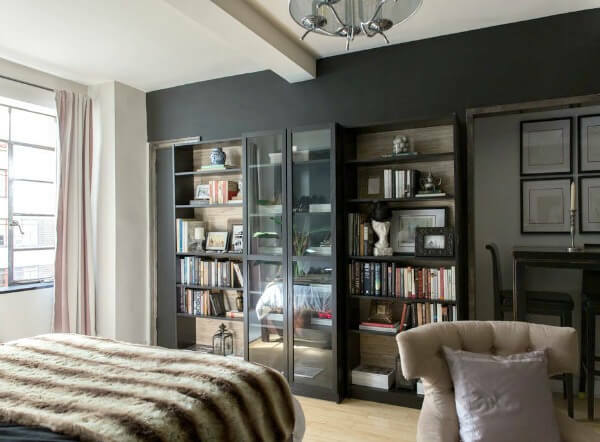 Vertical storage is a necessity in a small home. A thin console hugs the wall. A tiny kitchen, but she has managed to make it work. It just takes creativity and determination. The bathroom too is small, as is many apartment bathrooms. But it has a level of elegance that befits her style. I hope you enjoyed this small space tour. Living small can be done and done well. 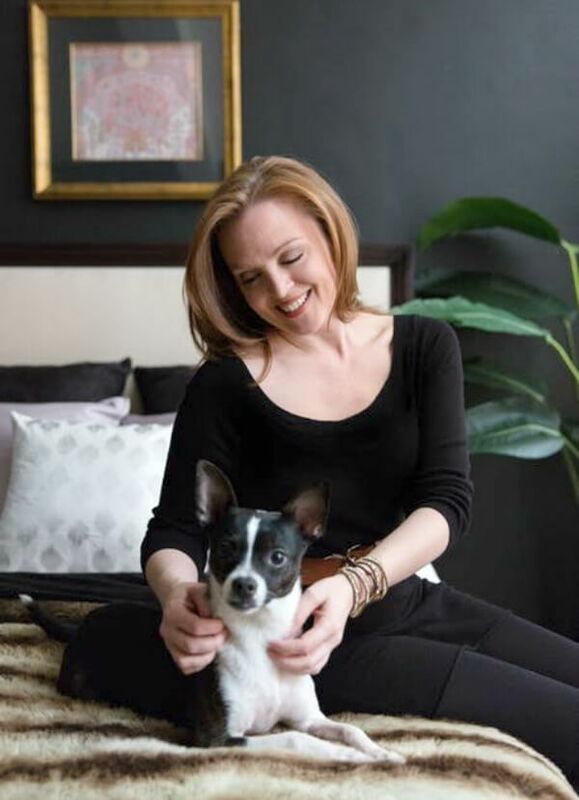 I like how her dog matches the black-and-white color scheme of the apartment! While I am a very informal person, I find so much that is appealing in this sophisticated and formal apartment. 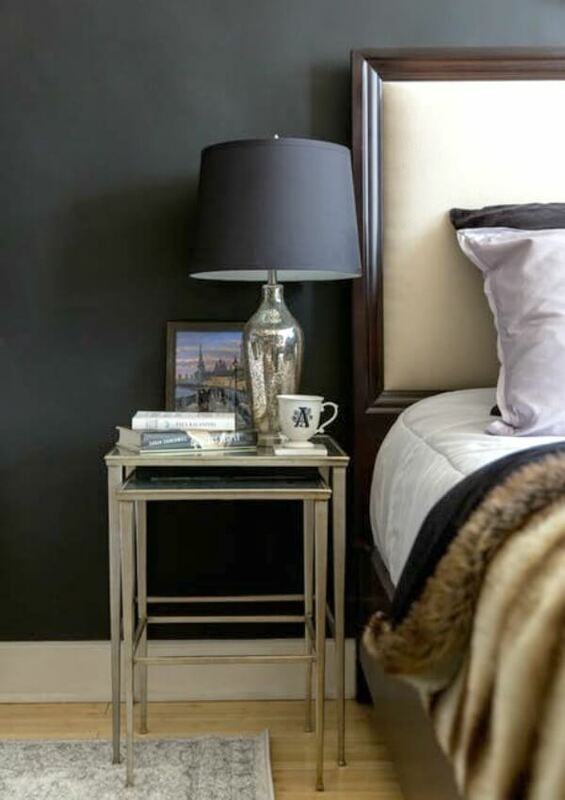 Angie has excellent taste and sense of balance, and knows how to incorporate some touches that keep the space from being too perfectly staged and cold, such as the wooden bowl in the kitchen, the pennies in the bowl on the trunk, and the faux fur on the bed. My hands want to reach out and touch those things. My favorite part is the painting over the bar. It seems to represent busy NYC blocks and buildings, but the colors are rather pastel which softens it. 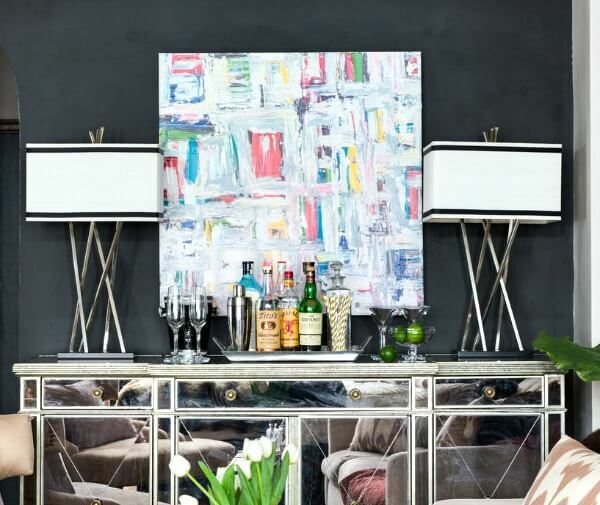 I don't want dark walls in my home, but they definitely are the right backdrop for this painting and the rest of the furnishings. Love her style. So chic and so well done. 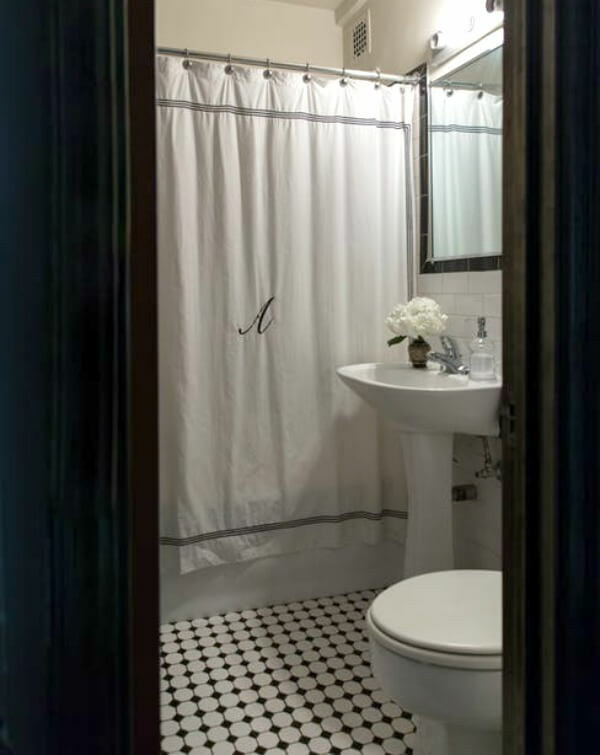 I love the built ins and the bathroom floor is a favorite, I love the black and white tiles. I am going to a smaller space than where I currently live but it is much bigger than this apartment so I definitely think I can make it work now I have seen Angie's place. Hope you are feeling better Brenda, I miss seeing Abi and Charlie, they are so adorable. This place is fabulous! I love it all. 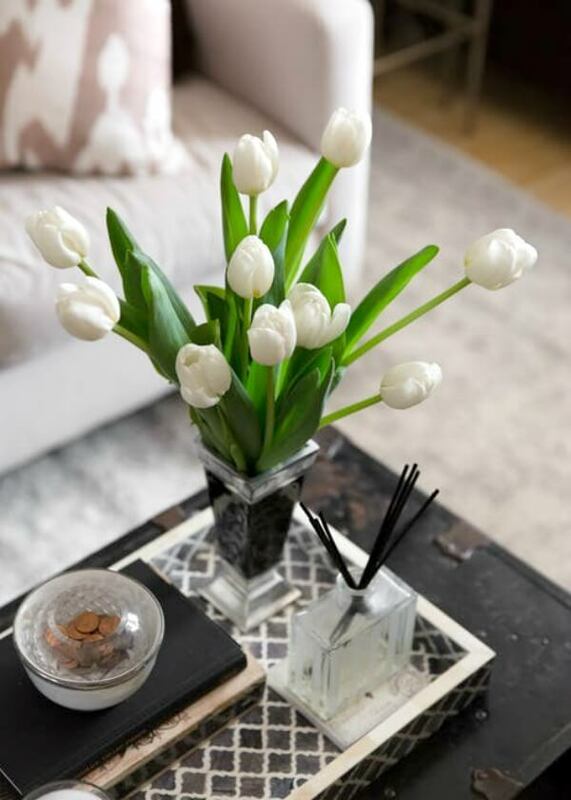 It is a perfect reminder that you can have a beautiful space with everything you want even in 350 sq ft.
No doubt that tiny space costs her about 5 grand a month in NYC!! My best friend had a studio in Greenwich Village back in the mid 80's that cost $2500/month plus another $800 for a parking space. Sick! She has great style, very classic and elegant. Hopping over to check out her blog! This is beautiful and elegant. I do like the dark walls in theory, but since I myself live in a small one bedroom apartment with only end windows, I find myself wishing for white walls. (I have a darker olive/beige wall paint. If I was not so old, I would attempt to repaint them white myself, but I have really tall ceilings which would require a tall ladder so I am pretty much stuck with them. But I dream of them. Her dog is adorable! I don't care for dark colors on walls and I prefer a more casual style of decorating, but it is amazing what she has done with her very small space! Does she have a refrigerator? I didn't see one.